At OZ Excavator Buckets, we’re focused on providing the best service to our customers at all times – and that applies to our prices, product quality, and turnaround times too. So throughout August and September, we ran a comprehensive Customer Survey to find out exactly what our customers think of us, and where we can improve. We emailed our survey to 1,790 of our customers, with the added incentive of the chance to win an Apple iPad Air for one lucky respondent. Here’s what we found. 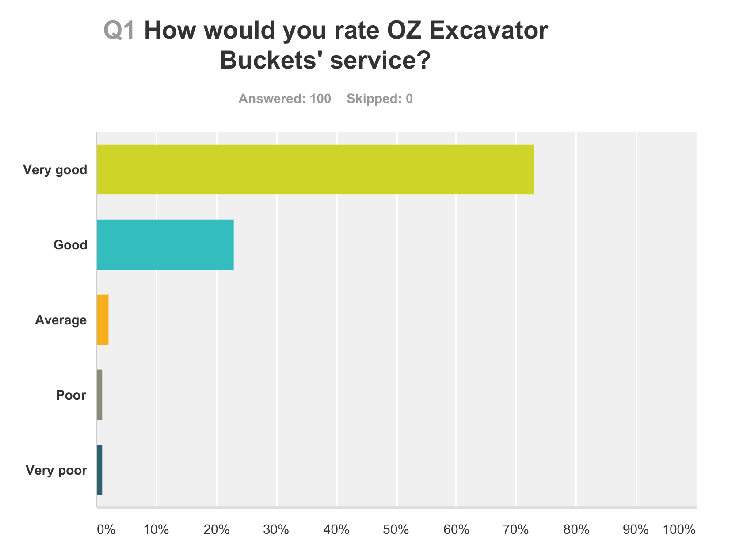 96% of customers rated OZ Excavator Buckets’ service in the top 2 categories: ‘Very Good’ or ‘Good’. The entire OZ Excavator Buckets team are dedicated to high standards of customer service. So it was gratifying to find that the vast majority of our customers find this to be the case. 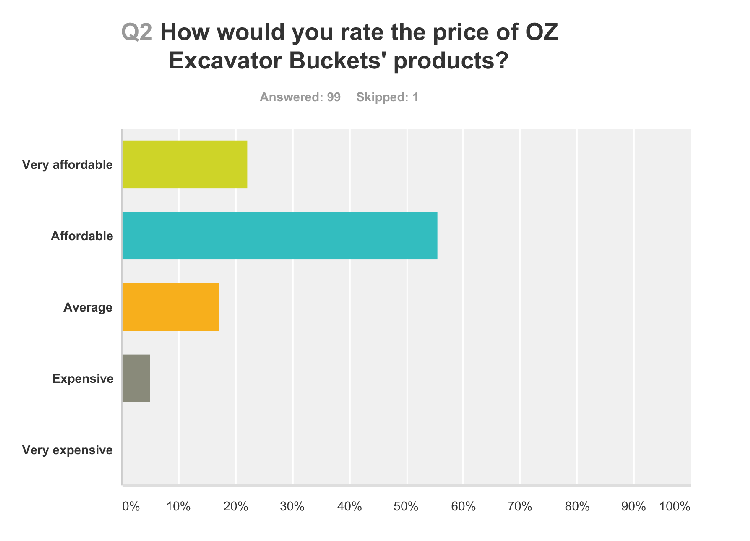 77% of customers rated OZ Excavator Buckets’ prices in the top 2 categories: ‘Very Affordable’ or ‘Affordable’. 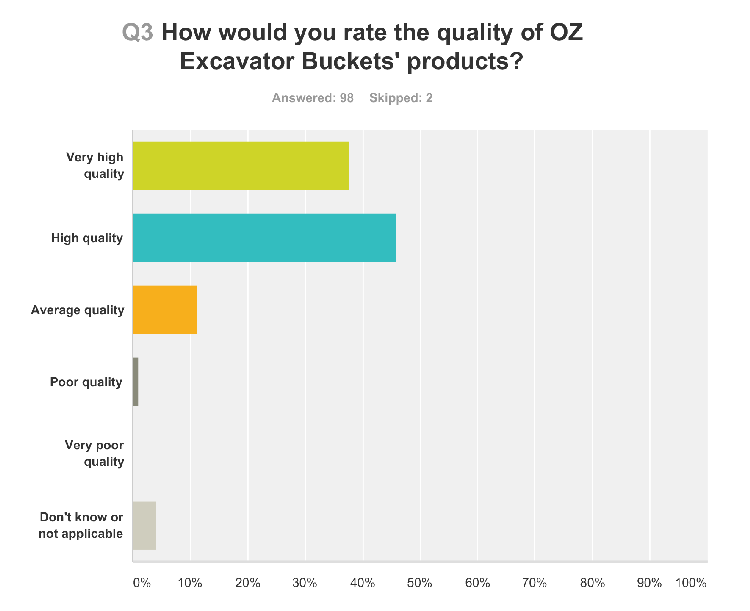 83% of customers rated OZ Excavator Buckets’ product quality in the top 2 categories: ‘Very High’ or ‘High’. 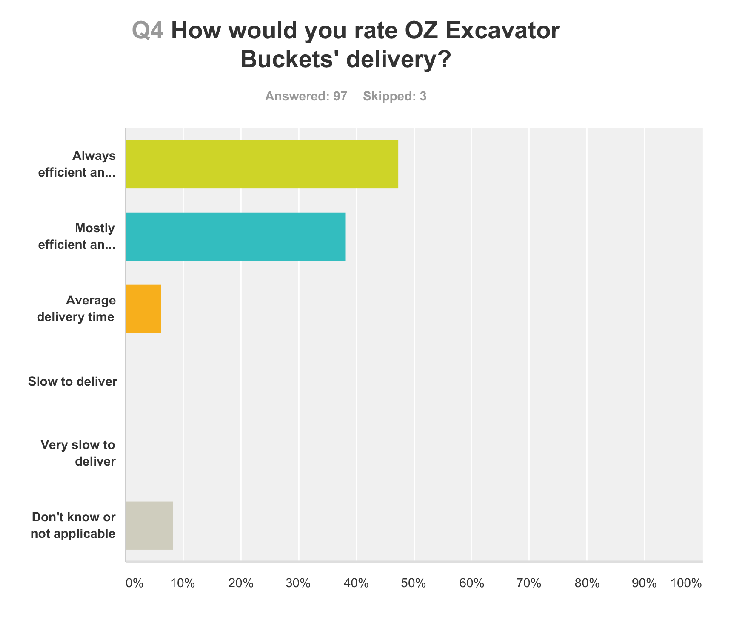 85% of customers rated OZ Excavator Buckets’ delivery in the top 2 categories: ‘Always efficient and on time’ or ‘Mostly efficient and on time’. 79% of customers rated OZ Excavator Buckets’ order turnaround in the top 2 categories: ‘Very Fast’ or ‘Fast’. Q6. What else can OZ Excavator Buckets do to give you better products and service? The lucky winner of OZ Excavator Buckets’ survey competition has been drawn. Stuart Gordon from Stuart Gordon Landscaping in NSW wins an Apple iPad Air for giving us his impressions of our service. Stuart needed a sieve bucket for his landscaping business, and after searching online found that OZ Excavator Buckets had just what he needed. “I shopped around and OZ Buckets had the best deal. The site was easy to navigate, easy to use,” Stuart said. “Definitely we’ll get some more stuff from you”. Thanks Stuart! Though we received a great response in our customer survey, the OZ Excavator Buckets team are always keen to improve our service as your excavator and backhoe attachment supplier. 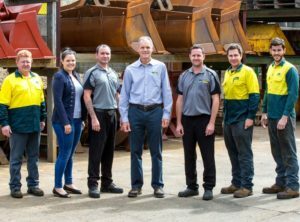 The OZ Excavator Buckets service team would be delighted to speak with you about our quality excavator buckets and attachments. Let us know how we can help you by calling Paul on 1300 246 009 or Chris on 0401 220 798.